An audio element is a Digital Audio Workstation (DAW) for your audio tracks. 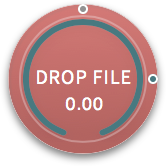 If an audio element does not have any tracks, it will be red, and the title will remind you to drop a file. Volume Indicator: Shows the master volume set for the audio element. Title: The title of the audio element. Will rename to the first audio track dropped into the element. Time Indicator: Shows the current running time of the audio element. Control Inlet: Accepts commands from a control line. Play Button: Plays the audio element. Audio Outlet: This is the output of the audio element. Volume/Time: Shows the current volume or time of the audio element. ⌘~ toggles between Volume, Time Elapsed, and Time Remaining. ★ Pro Tip: Holding Command (⌘) while dragging on a collapsed audio element will change the master volume. An expanded audio element works similar to any DAW. Note: You can only currently have one audio file per track. ★ Pro Tip: Holding Command (⌘) while dragging audio tracks onto a canvas will put all the tracks into a single audio element. When stopped, the play button will start playing the file when pressed. When playing, it will split into a stop button and a pause button. You can loop the element as may times as you want between 0 - Element end time by entering the number of loops you would like in the loops text box. ★ Pro Tip: Entering "0" or "inf" will set the element to loop infinitely. The Ruler shows the scale of the time for that audio element. You can set the current time to play by clicking on the ruler at the time you would like. This will set the playhead to that time. Or you can do this by typing into the elapsed text box in the upper right corner of the element. The Element end time is controlled by the element end time flag. You can change the end time by clicking and dragging on the end time flag. (The narrow black box in the timeline). You can also change the end time by typing it into the "Remaining" Text Box in the upper right corner of the audio element. Note: The end time will set to the longest audio track first dropped into the element. Each track has a track control cell to the left of the waveform where you can control multiple elements of the track. Volume: Allows you to set the volume on the track. Panner: Allows you to pan any stereo track left or right. Mute: Turns the volume off for that track. Solo: Solos or only allows you to hear the soloed track. Preview: Allows you to play that track without having to wait for the playhead to move down the timeline. Start Time: Sets the start time of the track down the timeline. Region Start: Sets the start trim of the track into the waveform. Region End: Sets the ending trim of the track at the end of the waveform. Fade In: Sets the fade in time. Fade Out: Sets the fade out time. Loops: Sets the number of loops for that track. Can be a decimal. (For example, 2.5 will loop the track two and a half times). Trim: Sets the trim volume level of the track. Track Volume is dependant on the Trim level. Each track can be edited in a similar manner to any DAW on the track editor. Start time: You can move the waveform down the timeline by clicking on the waveform and dragging it down the timeline. You cannot move it prior to 00:00.00. Region Start: You can trim the front of the waveform by moving your mouse to the front edge of the waveform. The cursor will change appearance, and you can click and drag to change. Region End: You can trim the rear of the waveform by moving your mouse to the ending edge of the waveform. The cursor will change appearance, and you can click and drag to change. Fade In: You can add a Fade-In to the waveform by moving your mouse to the upper left corner of the waveform. The cursor will change to crosshairs, and you can click and drag to change. Fade Out: You can add a Fade-Out to the waveform by moving your mouse to the upper right corner of the waveform. The cursor will change to crosshairs, and you can click and drag to change. Selected Track Name: The name of the currently selected track that will be edited. The Zoom buttons in the lower righthand corner allow you to zoom the waveform in and out, as well as make the waveform and control table larger. This makes it easier to see all the options available in the control table. The audio element options menu allows you to edit the track properties and global propertiess of an audio element. The audio element mixer options menu allows you to route any track to any output of the audio element. Each track has a crosspoint per channel. If you have a stereo track (pictured) you will have two crosspoints per output. Each Audio Element currently has 16 outputs. In the image below, all tracks are routed left out of output 1, and right out of output 2. The fade options menu shows you the fades currently attached to the element. Here you can add/remove/duplicate fades, and set the levels on the parts of the fade, set the duration, autostop, enabled, and fade name. If the autostop button is checked in the fade options menu on an audio element, when the fade is complete, it will stop the audio element and any currently running fades.